KAPADVANJ, DEC 15, 2016: The Kapadvanj Don Bosco Society (KDBS) has commenced weekend training of 30 children from standard five, hailing from poor rural backgrounds, in a bid to train them for the Navodaya Vidyalaya entrance examinations. The children being trained are from Kapadvanj block of the Kheda District in Gujarat. 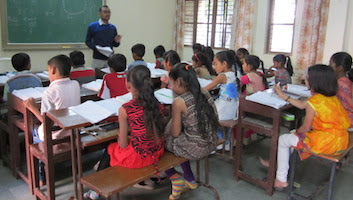 The Navodaya Vidyalaya System is a unique experiment unparalleled in the annals of school education in India and elsewhere, as envisaged by The National Policy on Education-1986 by setting up residential schools, called Jawahar Navodaya Vidyalayas that would enable students from rural areas to compete with their urban counterparts on an equal footing. Its significance lies in the selection of talented rural children as the target group with the attempt to provide them with quality education comparable to the best in a residential school system. The KDBS has decided to commence the project with specific targets, catering to the most neglected, identifying children with special talent or aptitude, providing them opportunities to access quality education, irrespective of their capacity to pay for it. 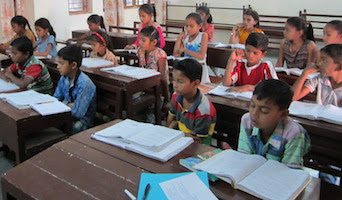 Father Mayank Parmar, Director KDBS-DRISTI said, "Our aim is to prepare poor rural catholic children of the Umreth Deanery including students from various villages where we are working, to pass the entrance test of the Navodaya Vidyalaya. We have launched an ambitious 24-weekend training programme for 30 children in three subjects - language, arithmetic and mental ability." The training programme was launched in August 2016 and has been functioning smoothly thus far, thanks to well qualified teachers and parental support. Besides, the youth of the Salesian Youth Movement (SYM) of the Umreth Deanery volunteer their services on weekends to help with the coaching and assistance of children. Father Dinesh Vasava said, "This is a two-way approach where we cater to the poor neglected children and also involve the youth to volunteer their time, energy and ability in helping the poor." The children and the youth volunteers hope that this will enable change of the local situation in the long run.